This event was held in the meeting hall at the Stonegate Country Club in Davis, CA. 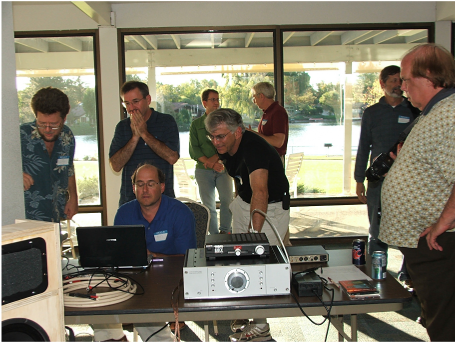 This was primarily a loudspeaker demo event but there were some swept sine speaker response measurements performed on an impromptu basis using a rig brought in by Bill Mennuti. We had a good turnout of about 20 people and raffled off some great stuff donated by Chaz! The man known as AE brought a pair of speakers that were, according to his admission, a work in progress using a single "full range pro driver" in a transmission line cabinet lined with felt and opening at the bottom. 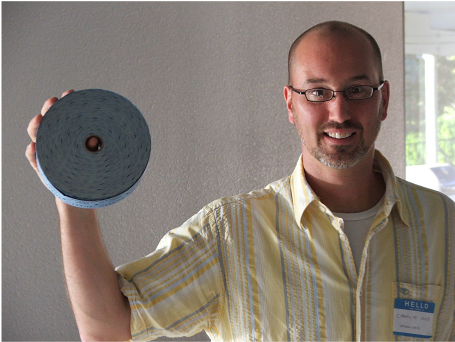 AE got some key FR measurements for his contour network from Bill's measurement rig. 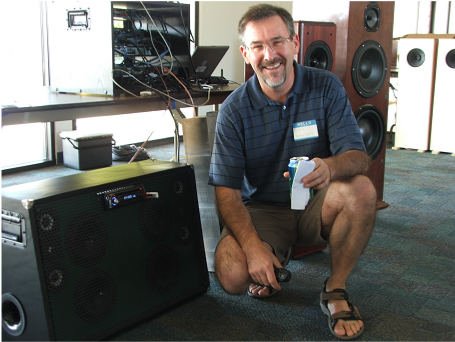 Louis brought his "boom box" system. Line powered car head amp, four channels for the woofers, and mids and tweeter sections. Great for some backyard patio music, and it could really crank out the tunes. 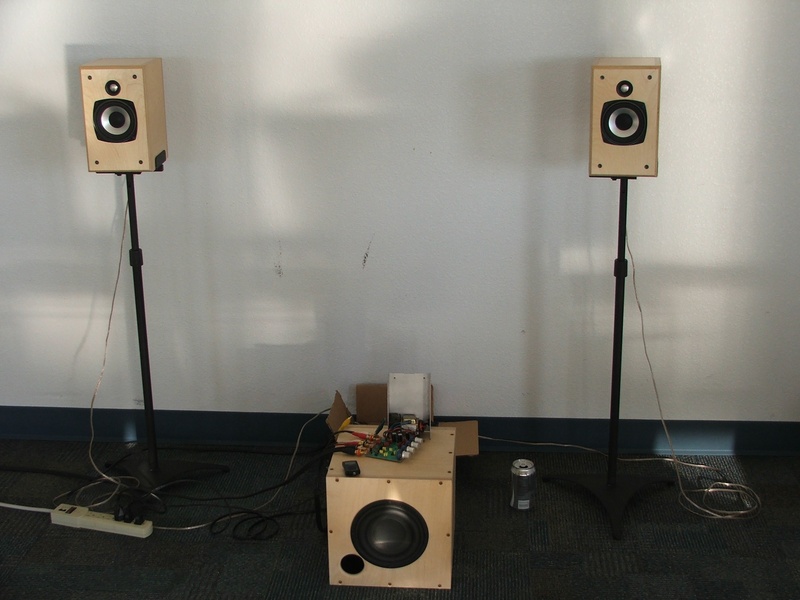 Peter Liloyan brought his three way towers (picture to the left, rightmost speaker). Super nice! 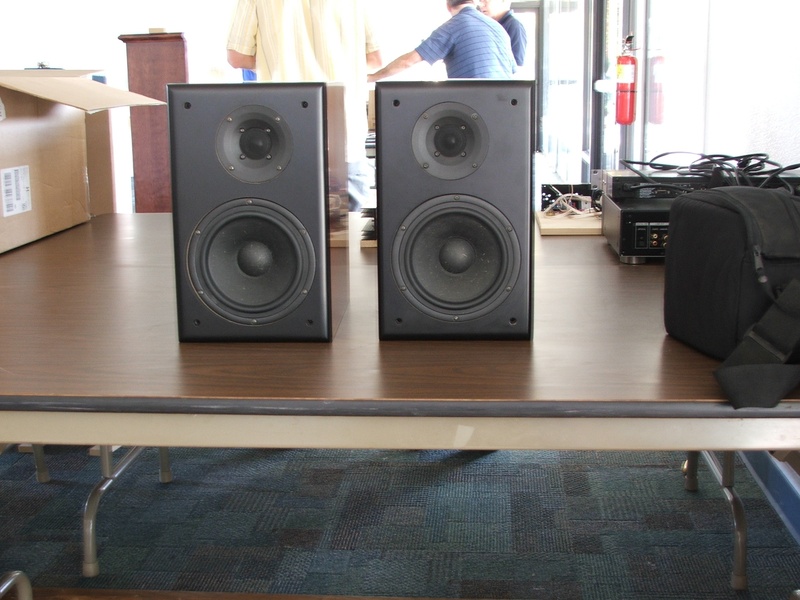 The drivers include Dynaudio 30W-100XL woofers, Focal 5W4252 mids and Scan-Speak D2905-9700 tweeters in a 4 cubic foot enclosure. Wow. 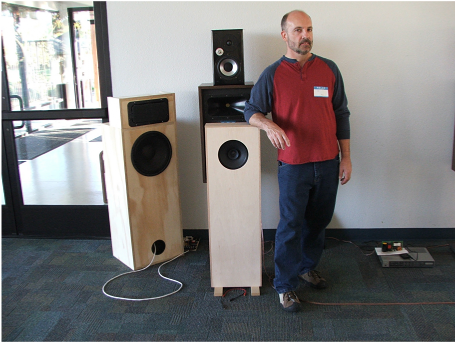 Dave Price demoed his MTM system (middle speaker) and also brought along an "in wall" design (left speaker) that he built. Everyone was looking forward to hearing Mark K's latest project, the ER18DXT two-way (click link to go to the project blog on his web site). 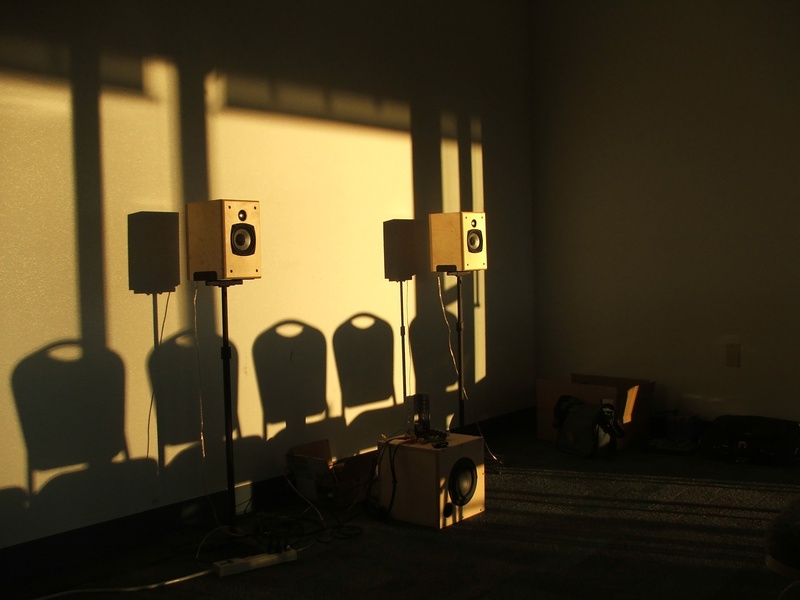 This was definitely a very well executed design, and had top notch sound quality as a result. 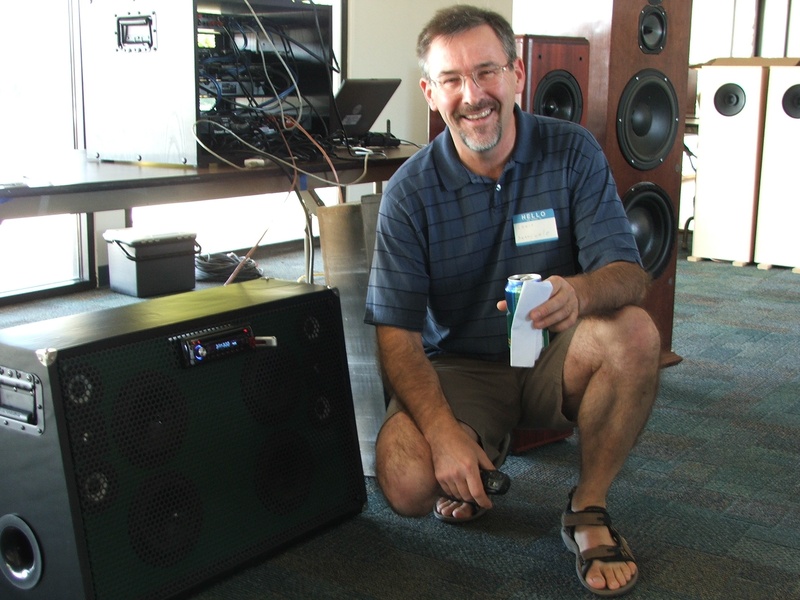 Mark used some of the clips from DIY Iowa to demo them, and many were astounded by the realism and fullness of the sound projected by this modestly sized speaker. Best in Show! 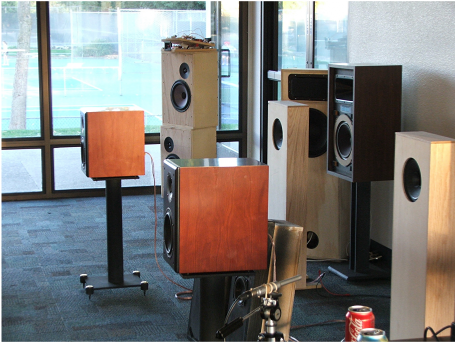 Some new faces to the group, "Zilch" and "WiredBecker" brought two AudioKarma Design Collaborative projects, the Karma Indignia (right) and an EconoWave design (above right picture, third from right at top) using an original Large Advent Utility w/woofer, Selenium D220Ti compression driver, JBL Progressive Transition waveguide, AudioKarma design crossover, and ZilchLab crossover PC boards. Both of these designs were very well received. The sound of the Econowave was well balanced and had none of the bad things sometimes associated with horn loaded tweeters, despite operating down to 1200 Hz. We're hoping to hear more from them at the next meeting! In the upper right pic, at the far right, is another system using nearly the same horn/driver combo brought by Bill Mennuti. Jon Pike and a friend drove all the way up from Orange County to join us. Jon brought along a sub+sat system which I unforunately did not hear. The sats are a pair of Zaph's ZBM4 Budget Monitor, The sub is a RJBAudio Cerebus. 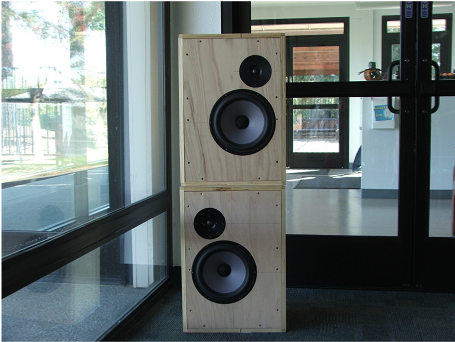 Both the sub and sat were made from 5/8" Baltic Birch. 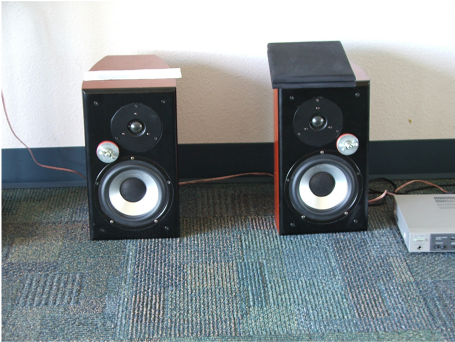 Jon used modified Reckhorn F1 crossover set to 125 Hz and a rumble filter at 20 Hz. The stands are a PE adjustable height sat stand. 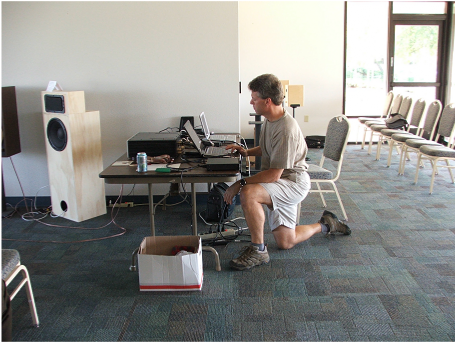 Jon drove the satellites with an EZ Amps (Aaronelectric) "Point Zero" kit, which has two channels powered by LM3886's. The sub is powered by the Parts Express 70W sub amp. John Busch brought two speakers to the meeting: a sealed two way in a 1.6 cubic foot sealed box (upper photo) and an open baffle two way (lower photo). The sealed system used a 10" updated version of the classic Dynaco A25 by Seas (running "bare back", e.g. 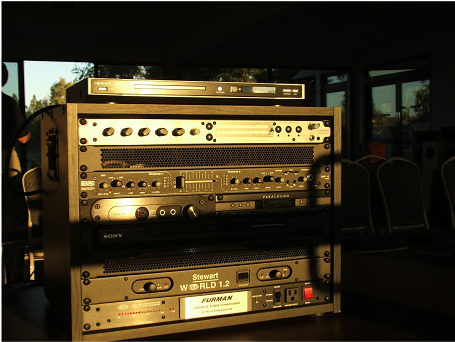 without low pass filter) and a ScanSpeak (?) tweeter (forget the model) crossed over around 2600 Hz. 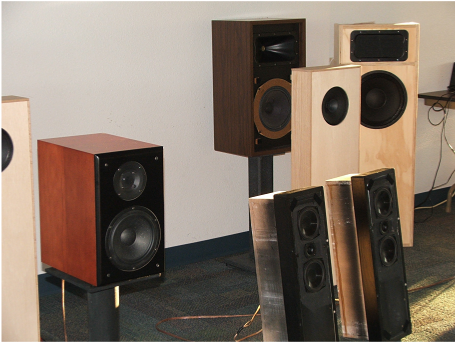 Below is an open baffle system he built, measuring probably 30" tall and 16" wide with triangular sides. He played some tracks through these while on a stand and the sound was incredible. Great bass extension despite the small baffle footprint. 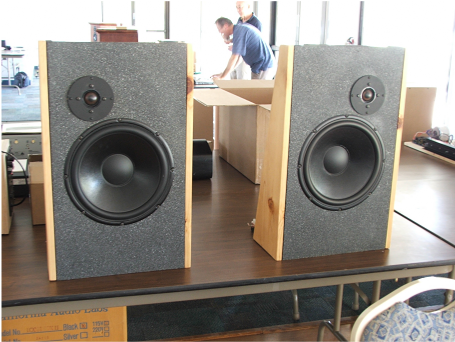 Crossover was about 900 Hz from a 12" driver to a large format tweeter. Very impressive! 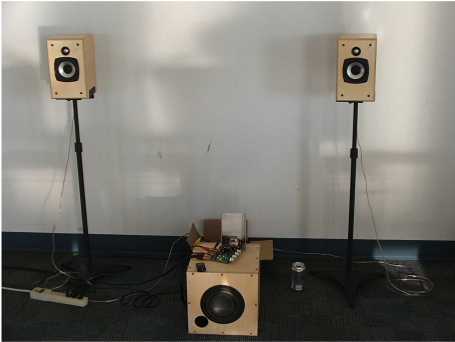 Charlie brought his active three way "AL3" speaker (lower photo) and electronics (upper photo). 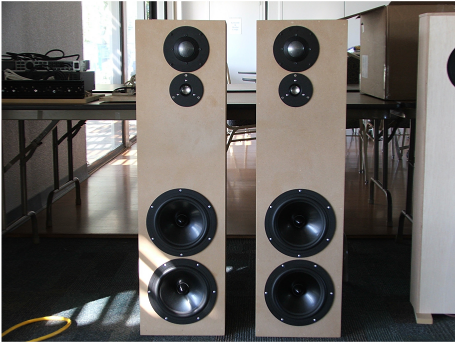 This system employs two Dayton RS225S-8 drivers in parallel, an LPG 51AT midrange, and a Tang-Band 25-1372SC 1" inverted dome tweeter. 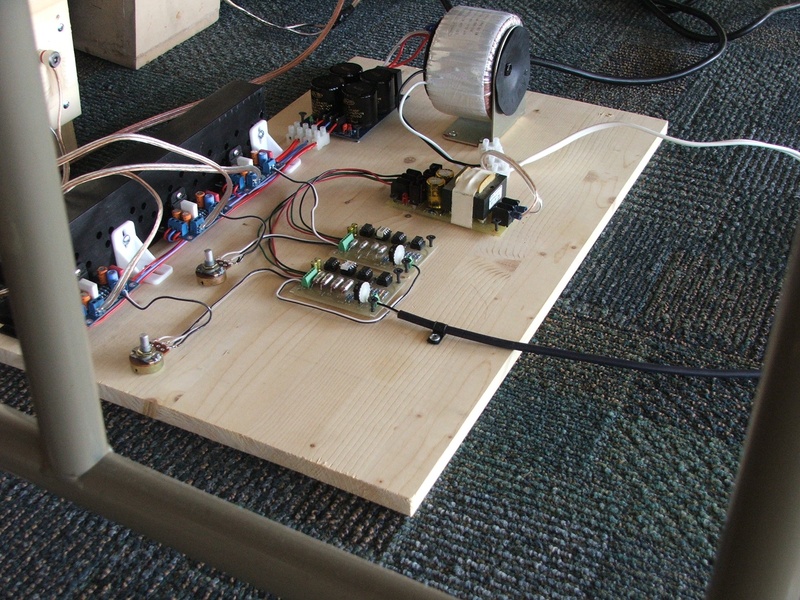 Each band was powered by an LM3886 chip amp with a 32V DC supply. 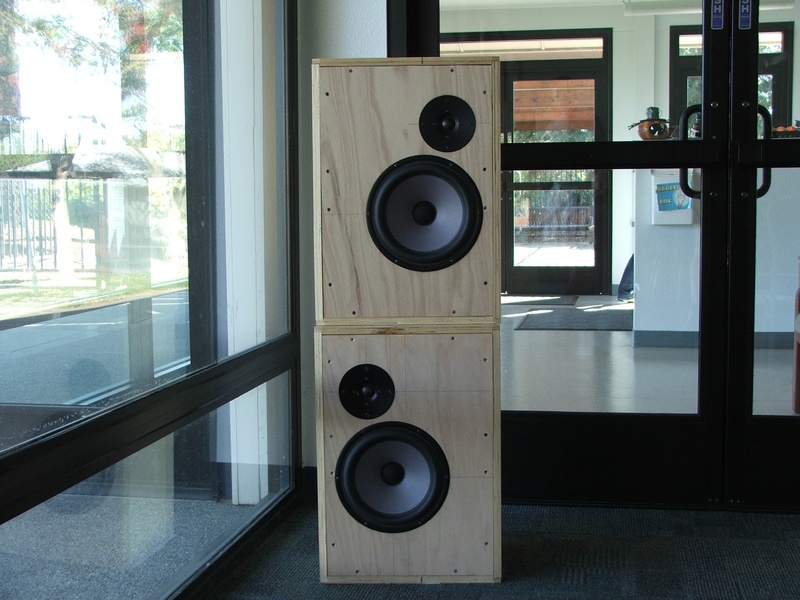 The cabinet is 75 liters tuned to 25 Hz using a 4-inch flared port. 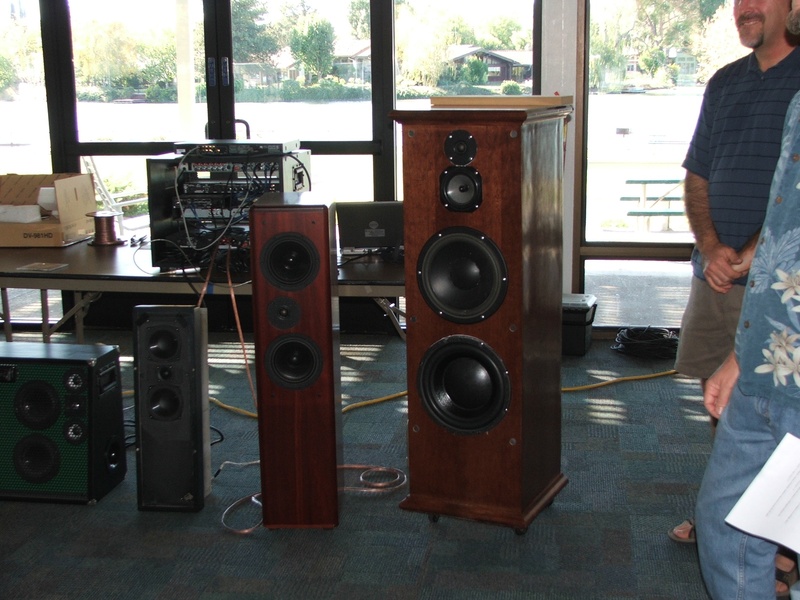 This system also received many positive comments. Although it was a little bright due to the lack of adsorption in the room, people seemed to like the sound alot! Also the look of the drivers got several thumbs up although Charlie still needs to finish off the cabinet woodworking and flush mount the mid and tweeters. A great work in progress. LEFT: Mark K checks the tracks for his upcoming demo. As the sun set on the meeting and the warm rays were streaming in to the room, everyone was glad to have met up again, with both new and old friends, to share our love of loudspeaker building and DIY audio!